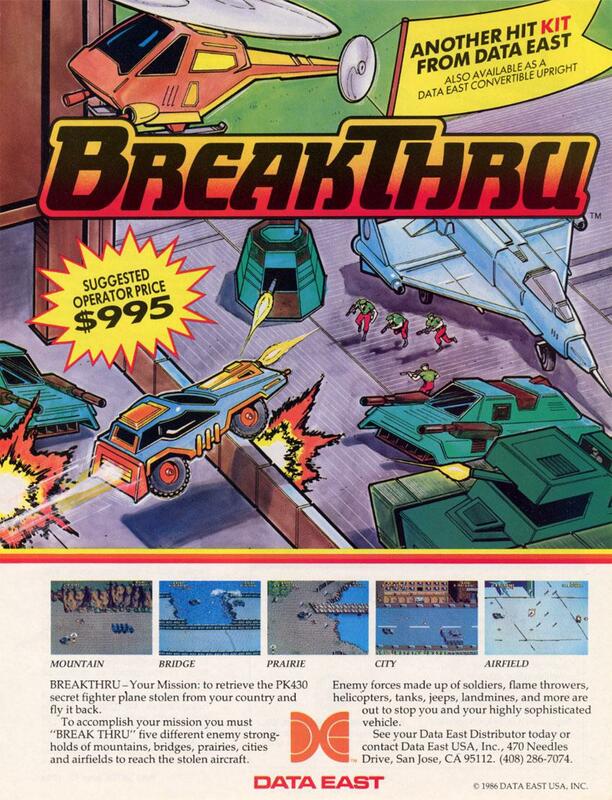 Break Thru - FLYING TIGER ENTERTAINMENT, INC. 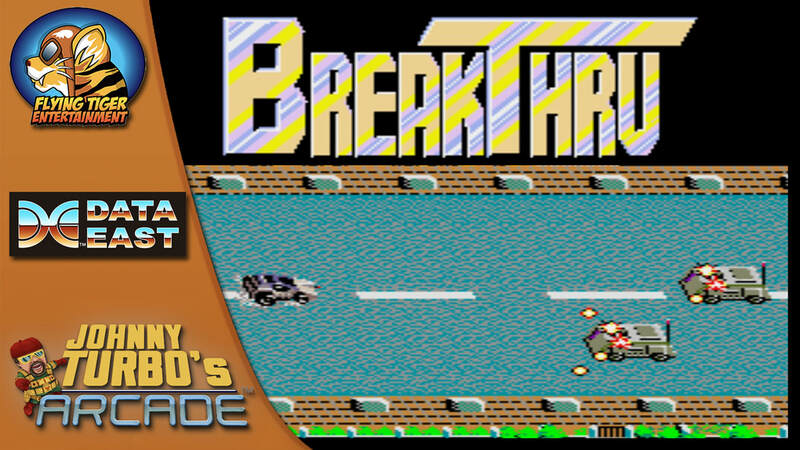 Flying Tiger’s Johnny Turbo’s arcade releases the 1990’s arcade classic, Break Thru for Nintendo Switch Now! Playstation 4, XBox One, and Steam coming soon. The goal is to drive a dune buggy to "breakthru" the enemy lines of five different areas. The five areas are "Mountain", "Bridge", "Prairie" (labeled as "Jungle" in early advertising), "City" and "Recover the Aircraft". Secret fighter plane PK430 has been stolen from your country, and it is up to you to get it back. You will drive a buggy equipped with a gun and "BreakThru" five different enemy strongholds. On your way you will encounter obstacles such as land mines, rocks, soldiers, jeeps, flamethrowers, tanks, trucks, armored vehicles, and helicopters. Extra lives can be found, as well as a power-up that gives the player a temporary three-way cannon. Upon completing the final level, after the ending sequence is shown, the player continues the game, but is prompted to select one of the levels to start at. The final win condition of this game is completing the final level a second time (no matter where he or she starts from). When this is accomplished, the game ends. Nintendo Switch: November 8, 2018 for the Americas and in selected European territories.